Another Spring Training TTM success came in the form of this success from Danny Duffy. I had several cards of his that I wanted to send, but I limited myself to two per on this one. I can always try again. I had to get the above 2007 Tristar Prospects Plus done in my first request, though. I had so many of these cards since I opened a ton at the card shop back in the day, but I had yet to add any to the album. The card turned out pretty well, even though the foil doesn't scan all that well. 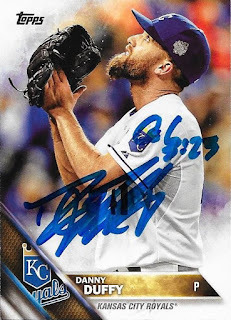 I also really liked this 2015 Topps of Duffy's, so it made the cut to be sent out. It looks great signed. Duffy (b. 1988) has played in the majors since 2011 for the Royals. He has a career record of 45-44 with 675 strike outs and a 3.77 ERA. He won the World Series with the Royals in 2015. He got roughed up in his first outing of 2018, going 4 innings and allowing 5 runs. Let's hope 2018 gets better for him as the season progresses. I mailed to Duffy on February 22 and got the cards back on March 5 for an 11-day TAT. I'm so far behind on TTM posts, it isn't even funny. I still have stuff from the 2016 National that hasn't been posted (and probably won'e be). Still, I continue to plug away at my posts; at least it gives me something to do in my free time. Here is a success from former catcher, Damian Miller that helped me add some 2000s cards to my binder. The above 2006 Topps is from a set that I just don't have too many extras from. I had a decent sized box of them, but when I was moving, the box turned over, and fell out of the truck into the street. Of course, it was raining, and a lot of the cards were ruined. I was pretty disappointed. At some point, I will buy a hobby box or two of these and restock. I also added a 2001 and a 2007 Topps to the binder. His Sharpie seems as if it was on its last legs, but the signature is still visible. Miller (b. 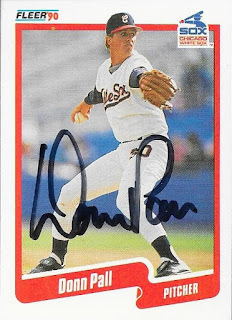 1969) played in the majors from 1997 to 2007 for the Twins, Diamondbacks, Cubs, A's and Brewers. He had 834 hits, 87 home runs and a .262 batting average. 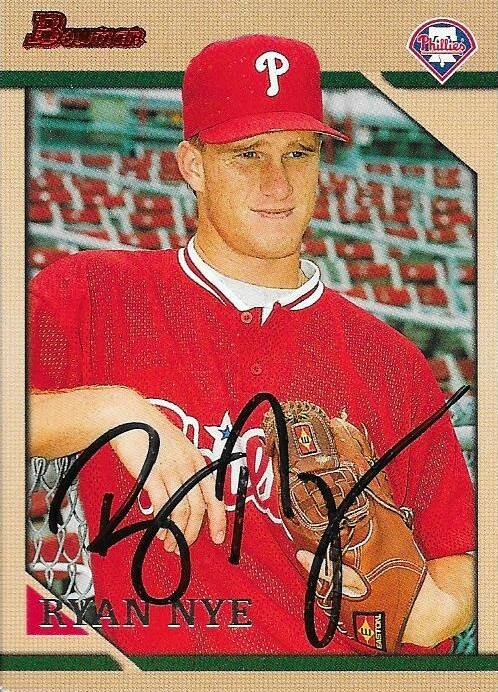 He was an All Star in 2002 and won the World Series with the DIamondbacks in 2001. I mailed to Miller on February 5 and got the cards back on March 5, for a 28-day TAT. 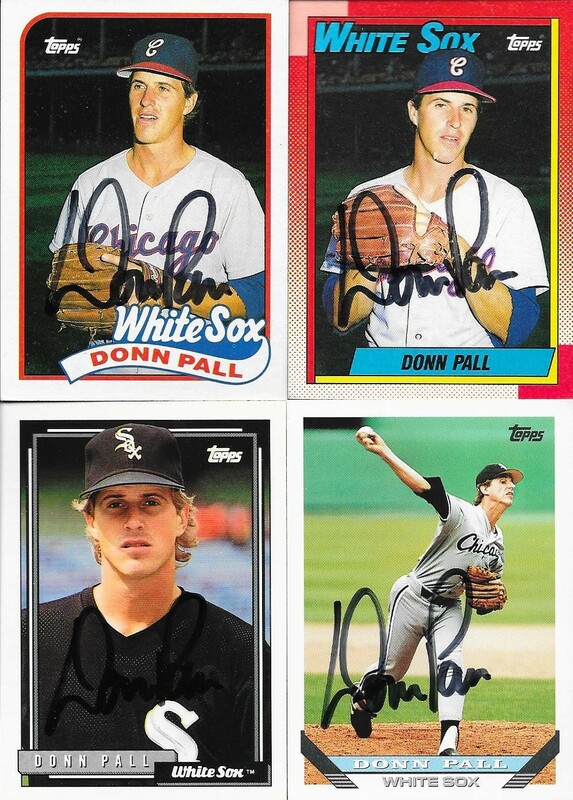 All kinds of TTM successes have rolled in lately. I have a lot from the late 70s - early 80s, lots of 87s, and some more recent stuff; with a few late 60s - early 70s tossed in as well. 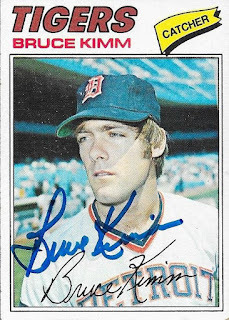 One of the late 70s group that came in was this success from Bruce Kimm. 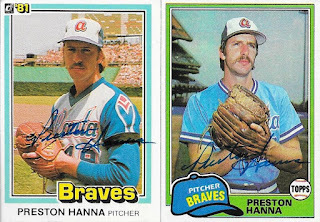 I like the 1977 Topps set (above), so it was nice to add one to the album. I have quite a few 77s, so it makes it so I have some good options when searching cards from that era. I actually have a good bit of cards from 76-79, so that's why that grouping is pretty dominant in my album. Might as well put them to some use. I also have a good many 1981 Topps. The old White Sox uniforms from that era are really odd, especially with that collar. Wow. Kimm (b. 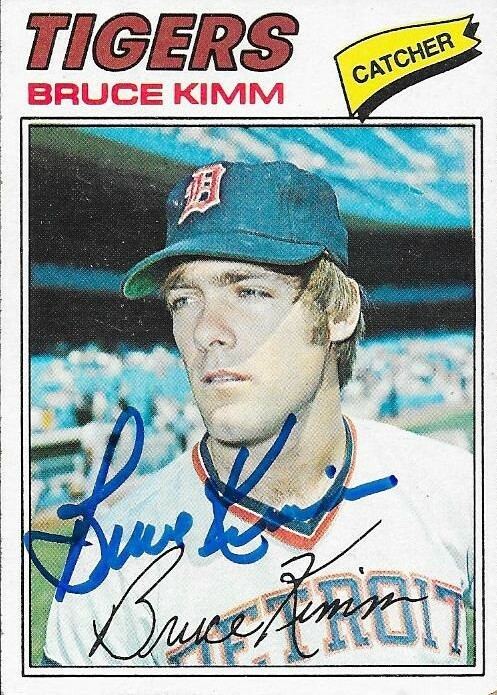 1951) played in the majors in 1976, 1977, 1979 and 1980 for the Tigers, Cubs and White Sox. He had 104 hits, 1 home run and a .237 batting average. He was the third of three managers of the Cubs in 2002, leading them to a record of 33-45 (.423%) across 78 games. Don Baylor started the season at the helm of the Cubs; Rene Lachemann managed them for a game, and then Kimm finished out the season. I mailed to Kimm on February 5 and got the cards back on March 3, for a 26-day TAT. I added a couple cool recent cards wih this success from Kyle Waldrop. 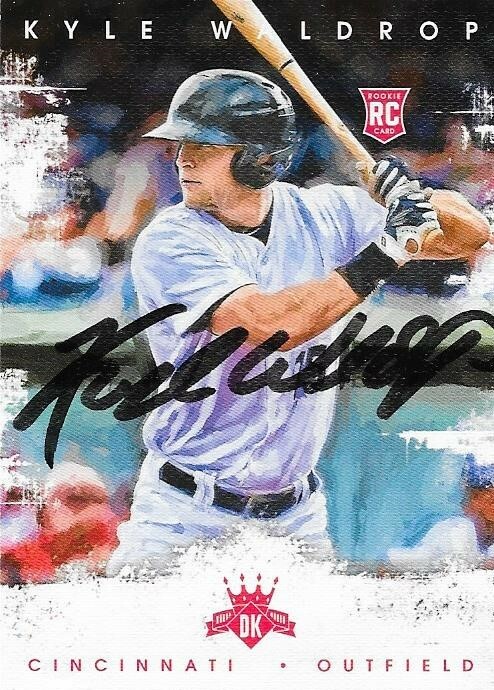 I had hoped to be able to add a Diamond Kings to my album, and this one is pretty nice. I mean, I have some older Donruss Diamond Kings, but this is a Panini. I like the oil painting feel to these, and the signature turned out pretty nice. I also added a 2015 Pro Debut. I really enjoy Pro Debut, especially 2015. They are nice cards, and I am glad I was finally able to put one in the album. I always feel like I miss out when searching through the ones that I have. Waldrop (b. 1991) played in the majors in 2015 and 2016 for the Reds. He had 5 hits, no home runs and a .217 batting average. He was granted Free Agency in November 2017, and has yet to sign anywhere. 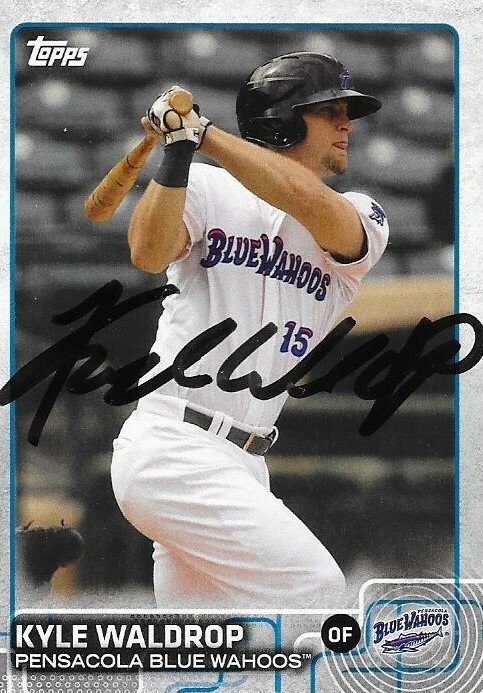 I mailed to Waldrop on February 15 and got the cards back on March 2, for a 15-day TAT. 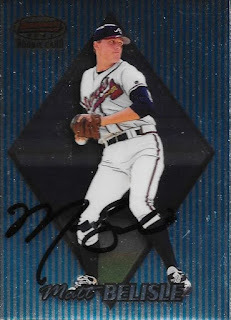 I received a TTM success from Ryan Nye that was spurred from my box busting while at Andrew's this past May. I busted a box of 1996 Bowman, and wanted to try to get a few of them into my album. The design reminds me of 1968 Topps, somewhat. 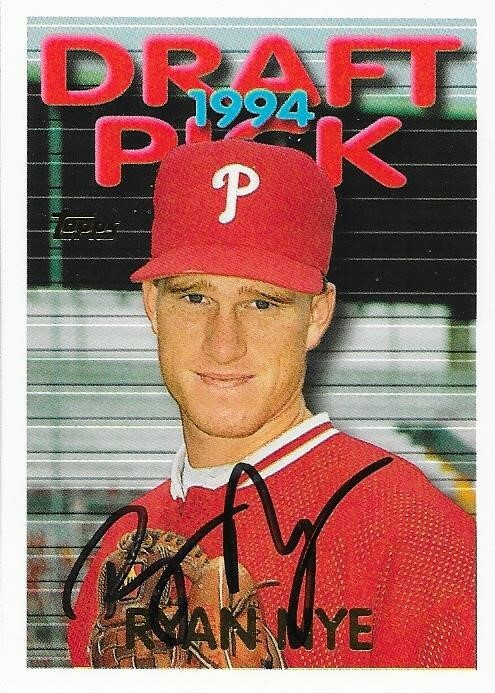 I also added a 1995 Topps, which was nice. Nye (b. 1973) played in the majors in 1997 and 1998 for the Phillies. He had a career record of 0-2 with a 9.69 ERA and 10 strike outs. I mailed to Nye on February 5 and got the cards back on March 1, for a 24-day TAT. 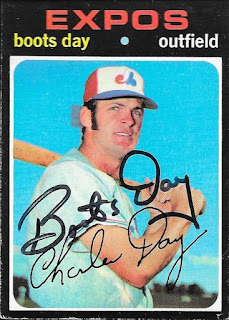 I added some cool Expos cards with this TTM success from Boots Day. I found the cards at my LCS and dropped them in the mail to see if I could add to my tally for 1971 and 1972 Topps. The cards turned out really nice. I have quietly added 25 1971 Topps and 19 1972 Topps to the album. 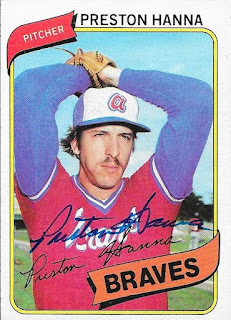 My favorite part of the older 70s cards is the old uniforms. They are always a fun look. Day (b. 1947) played in the majors from 1969 to 1974 for the Cardinals, Cubs and Expos. He had 295 hits, 8 home runs and a .256 batting average. I mailed to Day on February 5 and got the cards back on March 1, for a 24-day TAT. Here is another of the few TTM successes I got in from this year's Spring Training. I saw someone complain that they sent to Spring Training this year and had minimal successes, much like they had last year. They said that each year they say they aren't bothering with it next year, but always end up sending anyway. I think I am in that boat. I got some nice successes back, but guys that I really thought I had a good shot at getting didn't seem to sign this year. 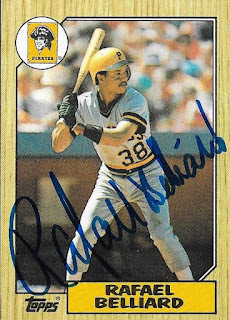 Oh well, at least Rafael Belliard helped me knock a 1987 off of my checklist. I sent two cards, the 87, and the above 1988 Topps. This 1988 is actually a pretty sharp card. It turned out really nice, and I am glad it was the other card I sent. 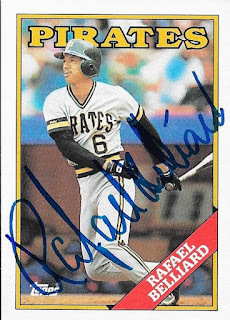 I do love the old yellow Pirates helmet on Belliard's 87 Topps, though. I had a ton of his cards that I could have sent, but I saw that anything more than 2 was kind of iffy. I wanted to ensure that I had the 87 taken care of, so maybe next year I will send a couple other of his cards. Belliard (b. 1961) played in the majors from 1982 to 1998 for the Pirates and Braves. He had 508 hits, 2 home runs and a .221 batting average. He won the 1995 World Series with the Braves. 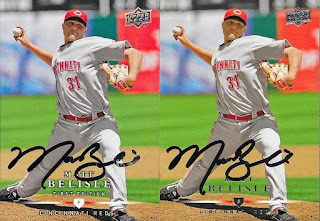 I mailed to Belliard on February 15 and got the cards back on February 26 for an 11-day TAT. When I sent to Bobby Witt last year, I hadn't quite committed to trying to complete as much as I could of the 1987 Topps set. So, I sent to him without including a 1987 Topps. 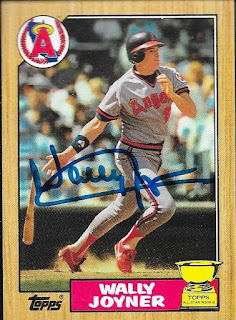 When I went to correct that error, I realized the reason one wasn't sent was because I didn't have a single Bobby WItt 1987 Topps in my box. So, I went on COMC and picked that card out. Since Witt signs a lot of cards, I added a couple others to my cart, just to have a little variety. One of the cards that I added was a set that hasn't been represented in my album, yet. The above 1986 Donruss The Rookies Bobby Witt is a nice card. I had the entire set at one point, but I am not really sure what I did with it. It is probably in a drawer somewhere, but it has been years since I have seen it. I also added a 1995 Fleer (middle), since I still enjoy that crazy set. The 1990 Upper Deck came out of a repack box that my wife gave me. I actually forgot to send a card of his I got from COMC, a 1997 Topps. I don't know how they all got separated, but they did. Oh well. I'm done bothering him for now. I mailed to Witt on February 15 and got the cards back on February 26, for an 11-day TAT. I sent off a bunch of cards to Spring Training this year, but didn't have very good results. 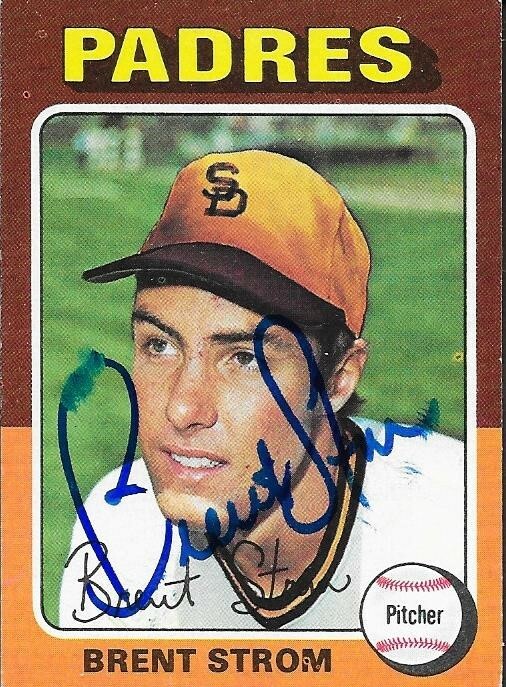 A few cards did come in, such as this success from Astros pitching coach, Brent Strom. 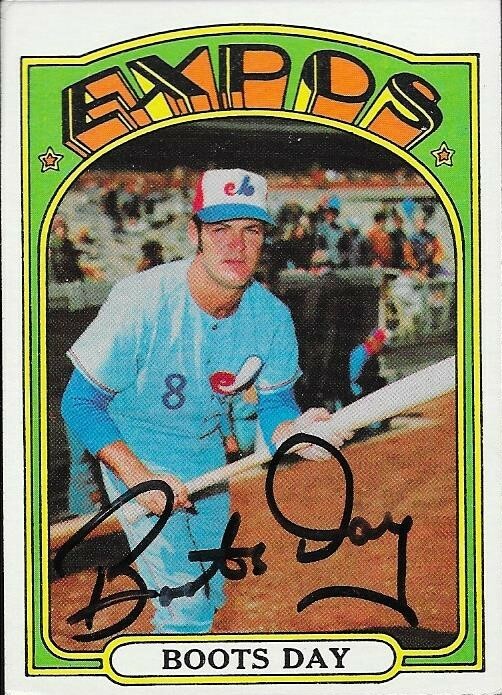 I had this 1975 Topps for a while that I wanted to get done, mainly because of the airbrushing that Topps did. The auto turned out ok, but had some smudging. Strom (b. 1948) played in the majors from 1972 to 1973 and 1975 to 1977 for the Mets, Indians and Padres. He had a career record of 22-39 with 278 strike outs and a 3.95 ERA. He was the pitching coach for the Astros when they won the World Series last year. I mailed to Strom on February 10 and got the card back on February 26, for a 16-day TAT. 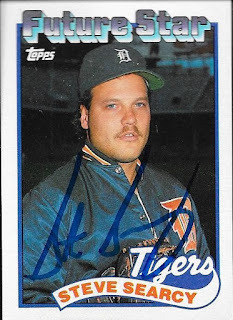 This might be one of the biggest TTM successes that I have gotten in quite a while. It is also the most expensive. There are a few players who have multiple cards in the 1987 Topps set. Roger Clemens is one of them. So, to get the three cards he has in the set signed, I had to shell out $25.00/card to his foundation. I couldn't stop there, though. 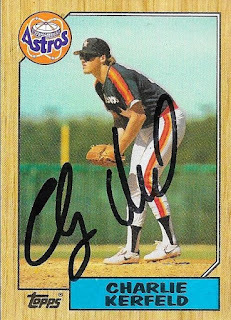 I have long enjoyed his 1991 Topps and figured that since I was going to all of this trouble, I might as well add that card the the TTM request as well. I'm glad I did. This card is awesome. 1991 Topps is a very under-appreciated set. There are several cards with great photography, and I have two of them in my album, now (the Wade Boggs being the other). The card looks awesome signed, I think. Clemens has three cards in the 1987 set. He has an '86 record breakers card (card number 1), a base card (card number 340) and an All Star card (card number 614). 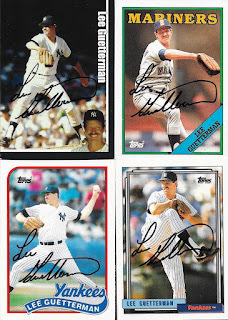 I was able to remove 3 cards from my checklist with one TTM success. Clemens (b. 1962) played in the majors from 1984 to 2007 for the Red Sox, Blue Jays, Yankees and Astros. 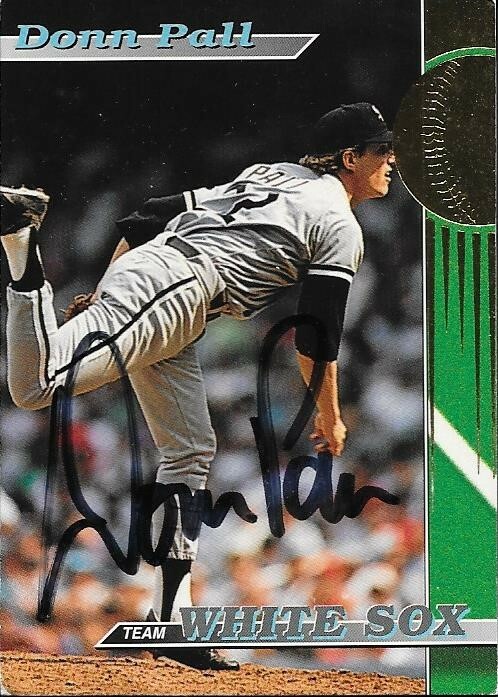 He holds a career record of 354-184 with 4,672 strike outs and a 3.12 ERA. He won the Cy Young Award seven times (1986, 1987, 1991, 1997, 1998, 2001 and 2004) and was the AL MVP in 1986. During the 1986 season, he went 24-4 with a 2.48 ERA and 238 strike outs. He won 20 or more games in 6 seasons; he struck out more than 250 batters 5 times). He was on 11 All Star teams and won the World Series in 1999 and 2000 while with the Yankees. Clemens ranks among the all-time leaders in wins (9th), games started (7th), strike outs (3rd), WAR (8th, if you care about that stat) and WAR for Pitchers (3rd). From my 25+ years of watching baseball, I can honestly say that Clemens was the greatest pitcher that I ever saw pitch. Clemens has been eligible for the Hall of Fame since 2013 (6 ballots) but has not received more than 57.3% of the vote. Anyone that has followed baseball knows that Clemens making the Hall is a long shot at best due to his connection to steroids. Clemens has not tested positive for performance enhancing drugs, and has denied taking them. However, he has been linked countless times, and has been investigated by Congress. The congressional investigation did not lead to any indictment, but for many folks, this has been enough to hold him out of the Hall. 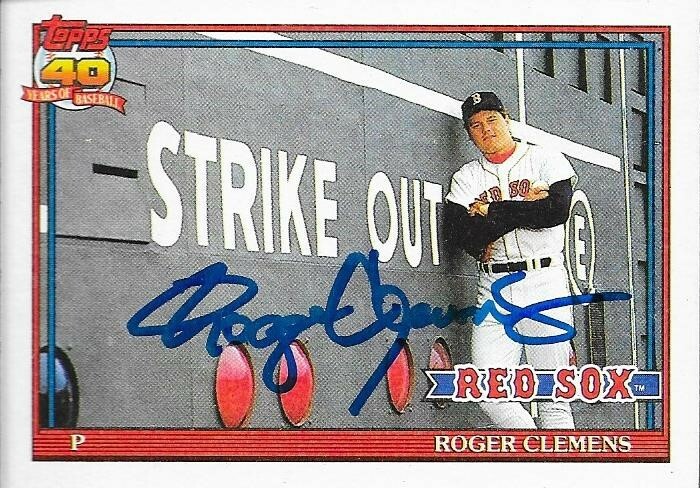 My own personal opinion, since this IS my blog, is that Clemens should be in the Hall of Fame. Who should and shouldn't be in the Hall is another discussion for another day, but Clemens was probably the greatest pitcher of his generation. Whether he did or did not do steroids, he was amazing. He sold tickets to games. He sold a ton of merchandise. Kids had his posters on their walls. He was the best. He probably could strike out some major leaguers today, even at 55 years old. Clemens was great. I mailed to Clemens on January 20 and got the cards back on February 26, for a 37-day TAT. I included a check to his foundation for $100.00 ($25/card). He charges $100.00 for baseballs, in case anyone was wondering. I'm moving right along with my 1987 set. 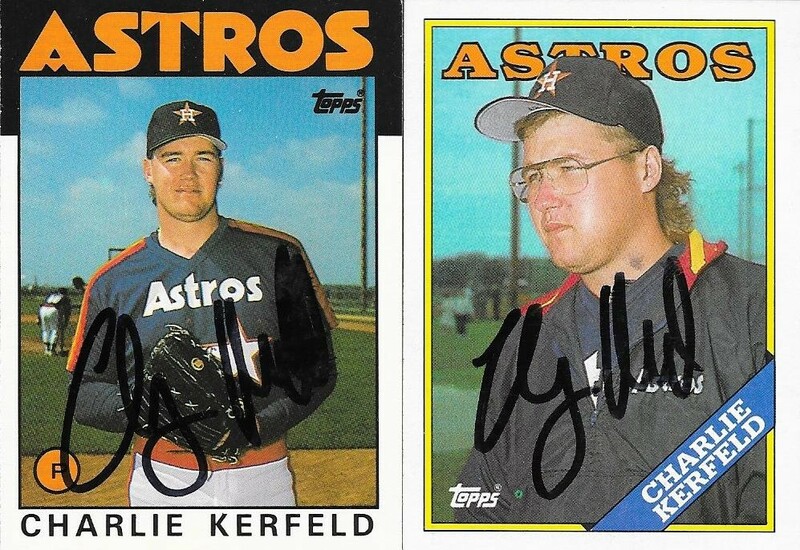 This time is a TTM success from Charlie Kerfeld. I mailed to him, but got a RTS, then I found a better address and immeidately tried again. 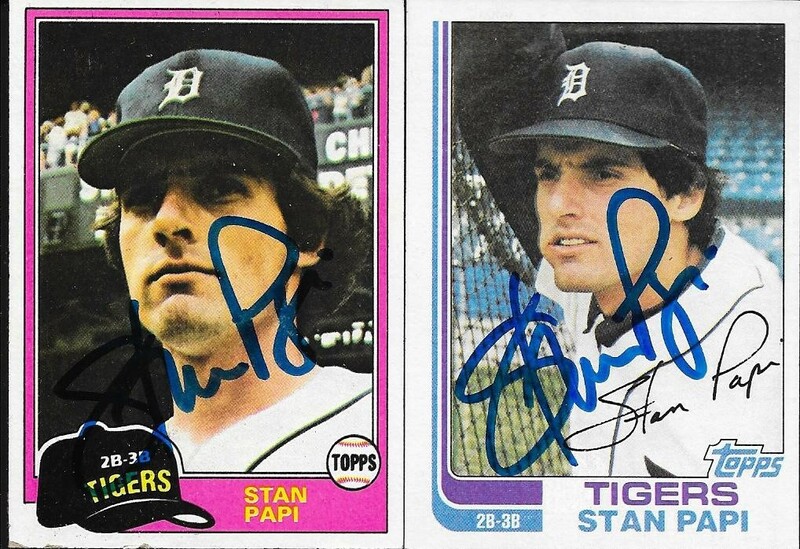 I also received these cards signed, a 1986 Topps Traded and a 1988 Topps. Kerfeld (b. 1963) played in the majors from 1985 to 1987 and 1990 for the Astros and Braves. 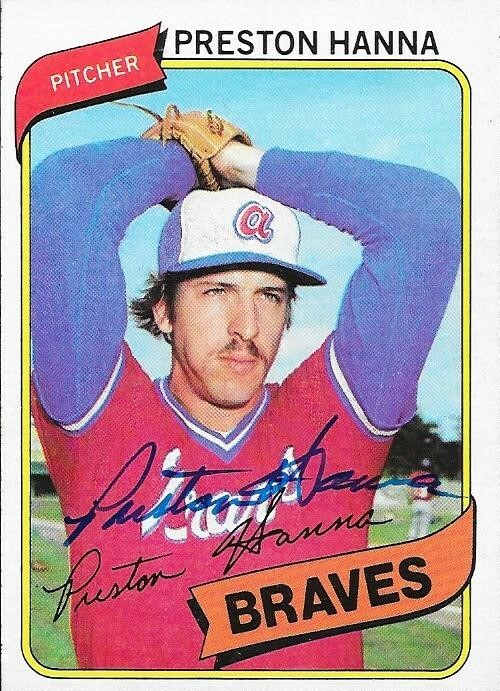 He had a career record of 18-9 with 155 strike outs and a 4.20 ERA. He finished 4th in the 1986 NL Rookie of the Year voting. 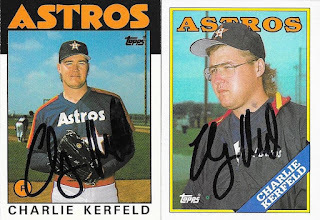 I mailed to Kerfeld on February 12 and got the cards back on February 24, for a 12-day TAT. Here is a cool TTM success that got me a 1989 Topps Future Star card signed. If I wasn't working on the 1987 set, I probably would consider 1989. Mainly because 1989 Topps were the first cards I ever got. I am working on 1987, though, because I had so many of them to start with, and I believe my friend, Max, had pushed me toward it early on. Still, adding other years of Topps to my binder is a lot of fun, and I intend to keep it up. 1990 Topps is always a fun set, too, with the crazy colorful borders. I feel like 2015 Topps was a nod back to 1990, and even 1975. Searcy (b. 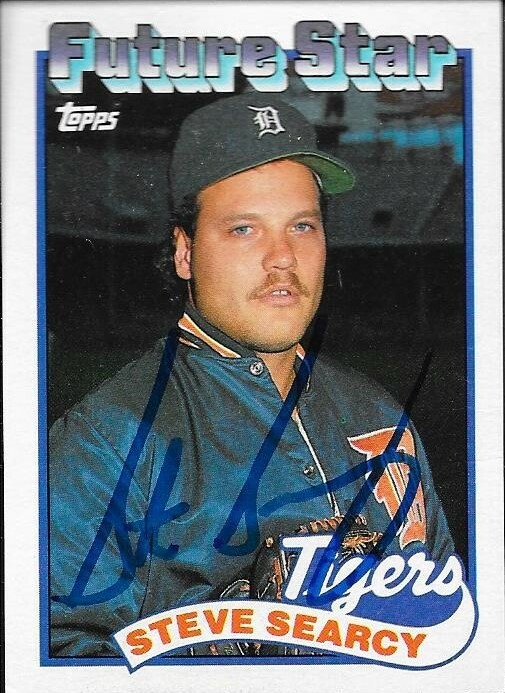 1964) played in the majors from 1988 to 1992 for the Tigers and Phillies. He had a career record of 6-13 with 140 strike outs and a 5.68 ERA. I mailed to Searcy on January 16 and got the cards back on February 23, for a 38-day TAT. 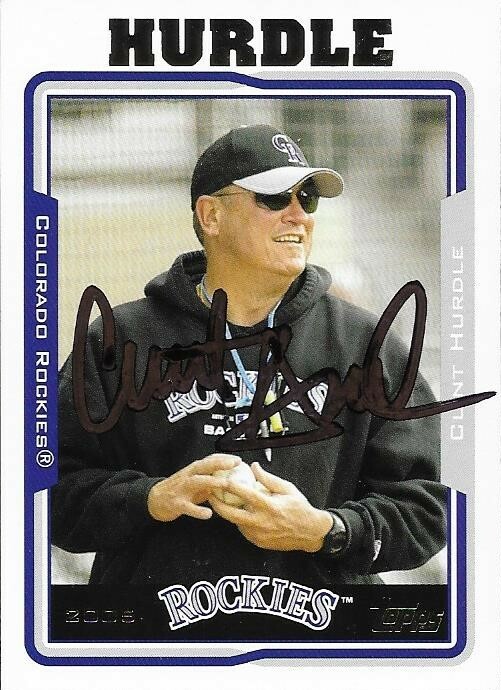 Another Spring Training success came in that I really didn't think would, when I got these cards back from Clint Hurdle. 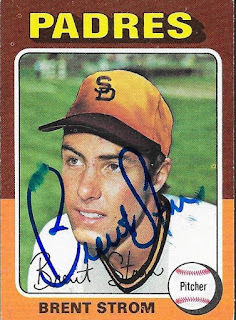 I hadn't seen that he was as prolific a signer as some other managers (Buck Showalter), but I figured I had a shot to get him. 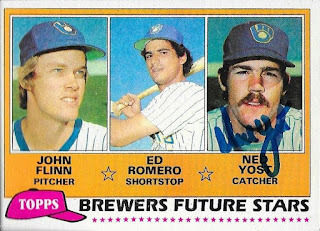 I'm really glad I did as this 1986 Topps turned out really nicely. 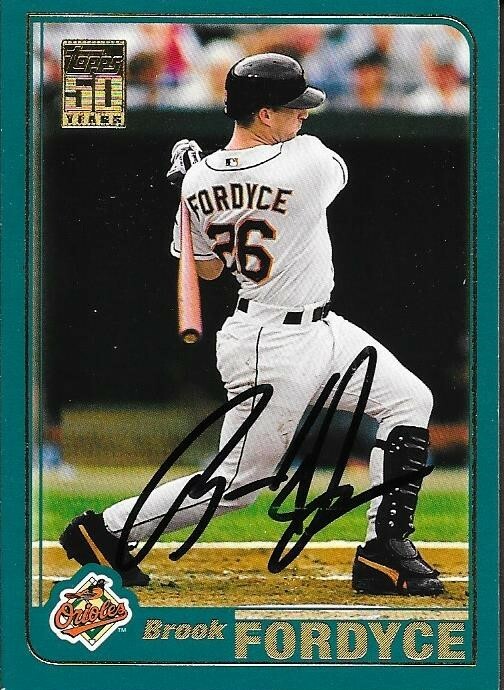 I also had his 2005 Topps, which looks pretty cool. Hurdle (b. 1957) played in the majors from 1977 to 1983 and 1985 to 1987 for the Royals, Reds, Mets and Cardinals. He had 360 hits, 32 home runs and a .259 batting average. 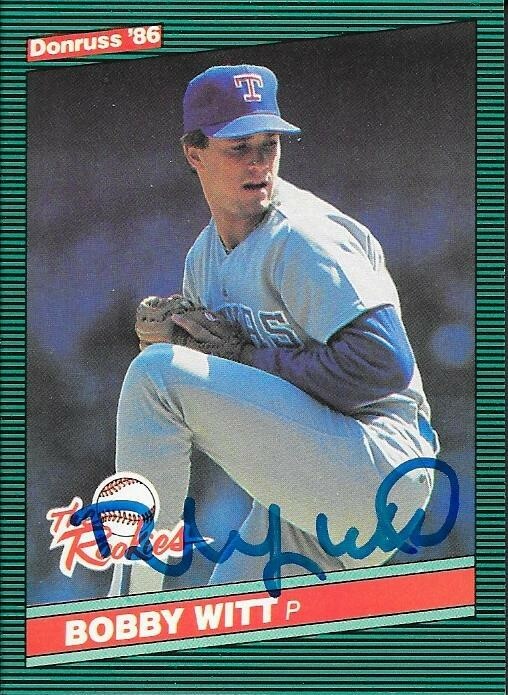 He was a first round (9th overall) draft pick in the 1975 June Amateur Dradft by the Royals. 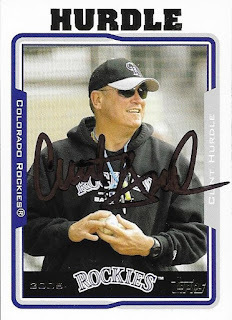 He would go on to manage the Rockies from 2002 to 2009 and the Pirates since 2011. He led the Rockies to the World Series in 2007. He was the NL Manager of the Year in 2013. His career managerial record stands at 1,118-1,174 (.488%). I mailed to Hurdle on February 10 and got the cards back on February 23, for a 13-day TAT. I have been using Sportscollectors.net for quite a while now to find addresses of players who sign TTM. I only recently discovered the private signings tab on the site that tells you when folks are hosting private signings with players. This could be at a card shop or a card show, etc. I have already used it to add some tougher names to my 1987 set. The first success I had come back was Wally Joyner. Joyner (b. 1962) played in the majors from 1986 to 2001 for the Angels, Royals, Padres and Braves. He had 2,060 hits, 204 home runs and a .289 batting average. He finished second in the 1986 AL Rookie of the Year voting (behind Jose Canseco) and was an All Star that season. He also finished 8th in the AL MVP voting that year. He appeared on the 2007 Hall of Fame ballot, but did not receive any votes. I mailed to the private signing for Joyner on February 12 and got the card back on February 23, for an 11-day TAT. I paid the fee of $15.00 for the signing. 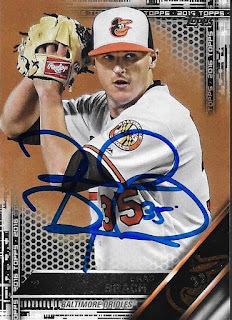 While I am always looking to add Topps cards to my album, I also look to add former Orioles. 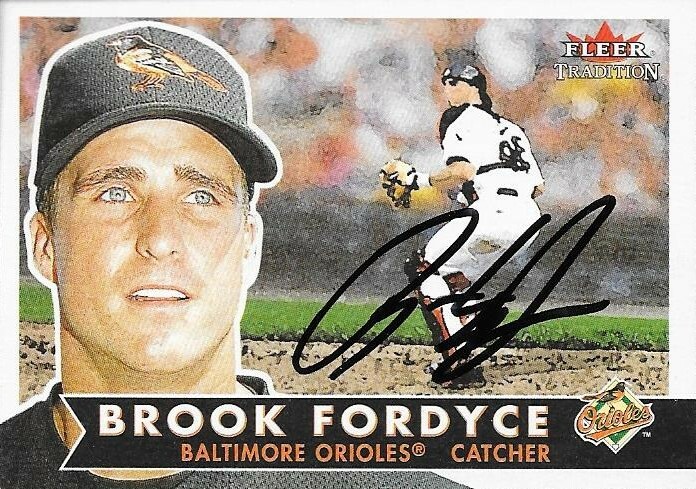 When I saw that folks were getting successes back from former O's catcher, Brook Fordyce, I went ahead and sent to him. I had his cards in my box for a while, but I hadn't seen recent successes until a few months ago. I liked this 2001 Fleer Tradition. The card came out really well, even though they kind of ripped off 1955 and 1956 Topps with the design. I did add a Topps card with this success, a 2001. I like how 2001 Topps looks. I had this card for a long time, so I know it wasn't one of the ones I got from my box busting at Andrew's house last year. Fordyce (b. 1970) played in the majors from 1995 to 2004 for the Mets, Reds, White Sox, Orioles and Devil Rays. He had 467 hits, 41 home runs and a .258 batting average. 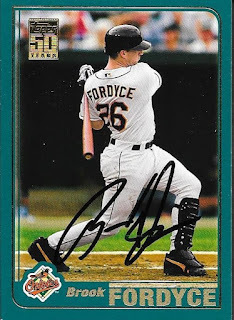 I mailed to Fordyce on February 5 and got the cards back on February 20, for a 15-day TAT. It is pretty hard to be disappointed when you get a TTM success from a Hall of Famer, but in the case of Ryne Sandberg, when I saw my return, I was actually a bit disappointed. The reason I was disappointed was because I paid his per-card fee of $5.00, but one of my cards came back unsigned. Yes, he missed my 1987 Topps for my set. That's ok, though, I re-sent the card this week, and I also included another fee. 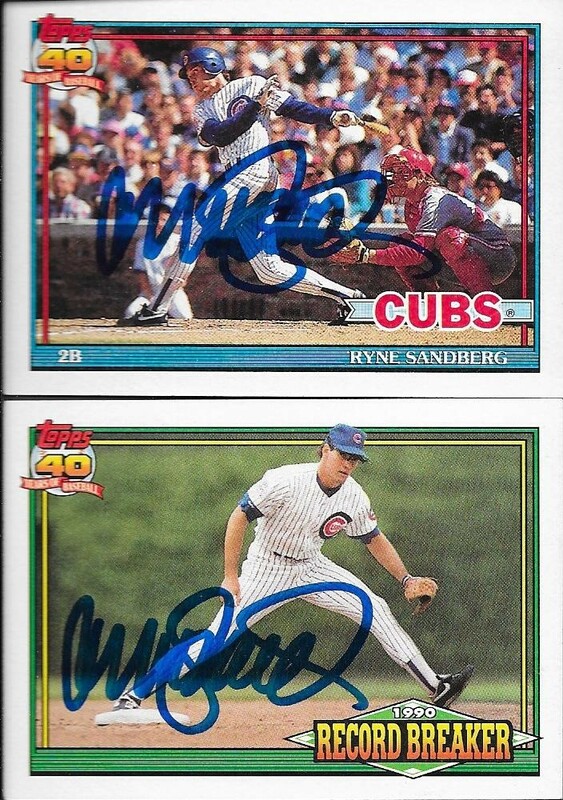 So, I did get some awesome cards signed by Sandberg, though. The above multi-exposure 1994 Topps was one that I had to include in the TTM request. The funny thing about Sandberg, though, is that I had very little to choose from, for his cards. I guess the ones I used to have went out to the numerous Cubs fans that I have come across over the years. I'm not even sure I have sent Max any, I think they went out to other Cubs fans before he came along. 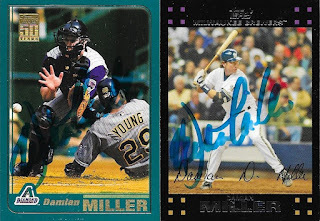 So, I went on COMC and picked out a few Sandberg cards that I thought would look cool in my album, and settled on the 1994 and the two 1991s below (and of course an 87). Both of these 1991 Topps turned out really nicely. I like that they both were horizontal cards, as they really help with the signature. Something else that I find funny about Sandberg is that I STILL don't have him on a ball for my Hall of Fame collection. I keep meaning to send a ball to him, but adding the 1987 to my set seemed like a better one to do first (and now second). So, if that card comes back, I will probably look to getting him on a ball. Sandberg (b. 1959) played in the majors from 1981 to 1994 and 1996 to 1997 for the Phillies and Cubs. He had 2,386 hits, 282 home runs and a .285 batting average. 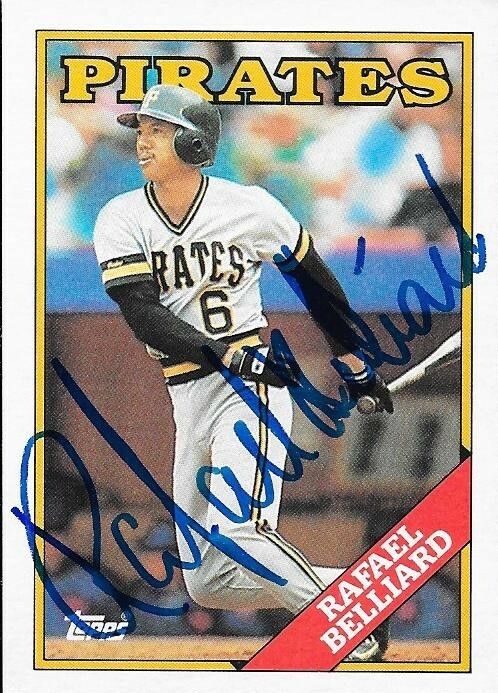 He was the NL MVP in 1984 and was an All Star from 1984 to 1993. Not really known as a power hitter, Sandberg hit 40 home runs in 1990. He was a Gold Glove Award winner from 1983 to 1991, and a Silver Slugger in 1984, 1985 and 1988 to 1992. Sandberg was elected to the Hall of Fame in 2005 (his third ballot) when he was named on 76.2% of the ballot. I mailed to Sandberg on February 7 and got the cards back on February 20, for a 13-day TAT. I sent a check for $20. Here is another TTM success showing some cards from the late 70s/early 80s. I went through my boxes from that era and pulled out a bunch of guys who sign. I like this Stan Papi success for many reasons. 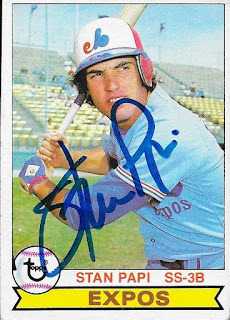 We have a sweet Expos batting helmet, and the guy's last name is Papi. Nice! 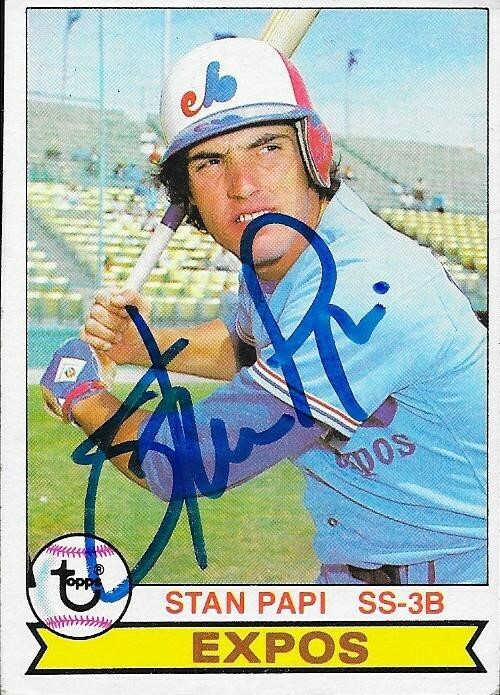 Papi's 1981 Topps is a bit dark, but the signature still shows up pretty well. Papi (b. 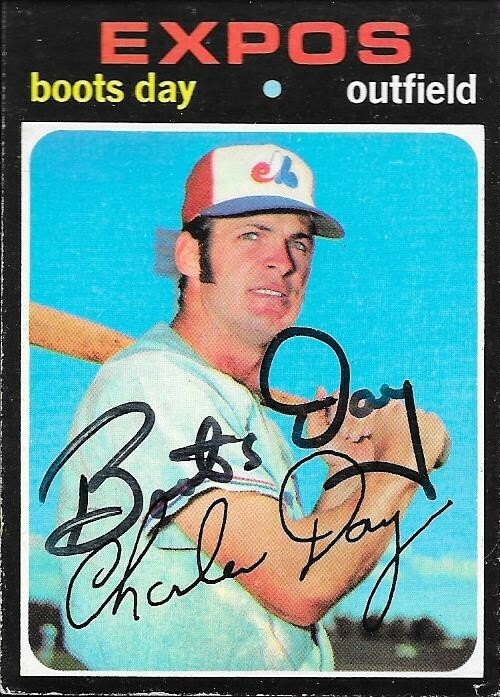 1951) played in the majors in 1974 and 1977 to 1981 for the Cardinals, Expos, Red Sox and Tigers. He had 114 hits, 7 home runs and a .218 batting average. I mailed to Papi on February 5 and got the cards back on February 20, for a 15-day TAT. 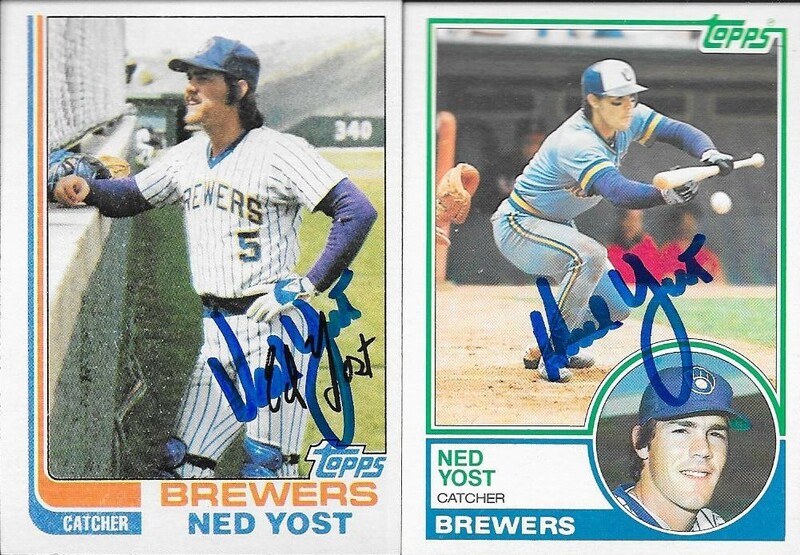 While searching for cards to send to Spring Training, I found a few more Ned Yost cards to send to him. I had gotten him last year, and decided to add him to the list, again. 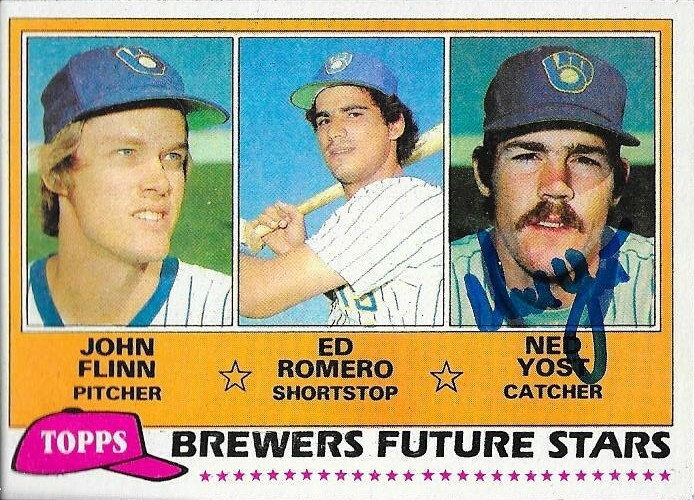 The above 1981 Topps Brewers rookies turned out really well. I'll have to see if any of the other guys on the card sign at all. 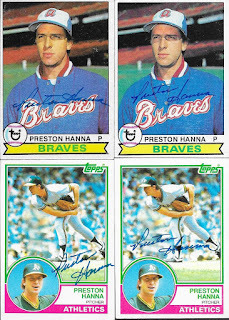 I also added these 1982 and 1983 Topps. The both look nice, I think. Yost had a rough off-season. He fell out of a deer stand and broke his pelvis, and almost died. Luckily, he has made a full recovery and has returned to the field. I mailed to Yost on February 10 and got the cards back on February 20, for a 10-day TAT. I got a nice 1975 Topps via a TTM success from Al Downing. The card turned out really well. I wish I had a couple more of his cards to send off, but this was the only one. Downing (b. 1941) played in the majors from 1961 to 1977 for the Yankees, A's, Brewers and Dodgers. He had a career record of 123-107 with 1,639 strike outs and a 3.22 ERA. He was a 20-game winner in 1971 with the Dodgers when he went 20-9. That season, he finished 3rd in the NL Cy Young Award voting and 10th in the NL MVP voting. He didn't perform all that well in the three World Series in which he appeared. He went 0-3 with a 6.06 ERA. 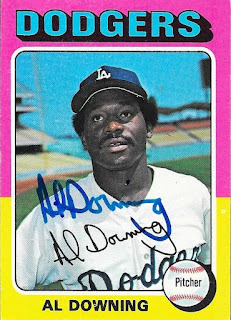 Downing is probably most well known as the answer to a trivia question; he gave up Hank Aaron's 715th home run on April 8, 1974. I mailed to Downing on February 2 and got the card back on February 17, for a 15-day TAT. 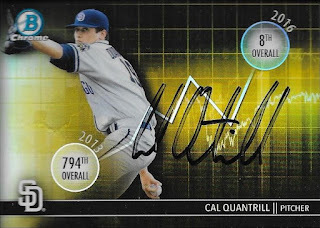 I sent a TTM request to Padres prospect, Cal Quantrill, via Padres Spring Training, and received a success. He signs only one per, so I sent off this 2016 Bowman Draft insert. Unfortunately, the Sharpie he used was on its way out, and the auto didn't turn out as nice as I had hoped, but it is still a success. I have a couple other prospects on inserts like this one, so I hope I get some better results soon. Quantrill (b. 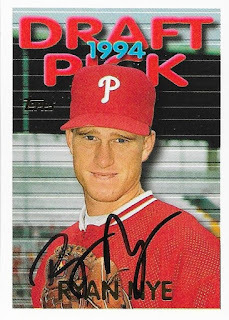 1995) was a first round draft pick (8th overall) by the Padres in 2016. He has played as high as AA for the Padres. 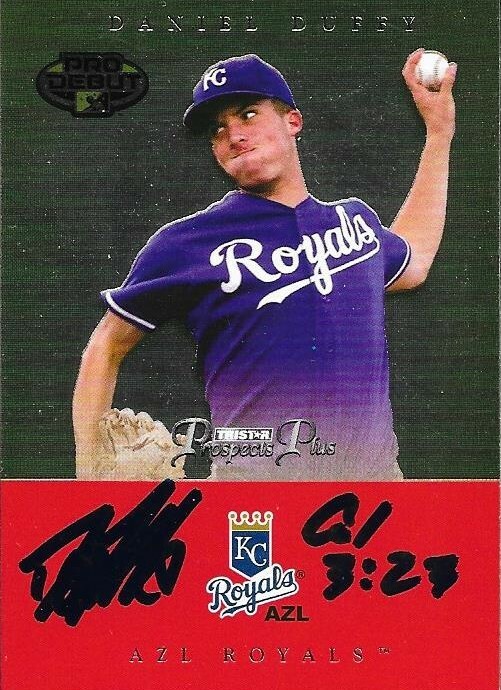 In his minor league career, Quantrill has a record of 7-15 with a 4.12 ERA and 156 strike outs. This is across 34 games started. He still has a lot of room for improvement. So far during this year's Spring Training, he is 1-0 with a 12.00 ERA. My best bet would be that he starts the season at High A again, and moves up to AA shortly thereafter, but he could very well begin the season at AA. 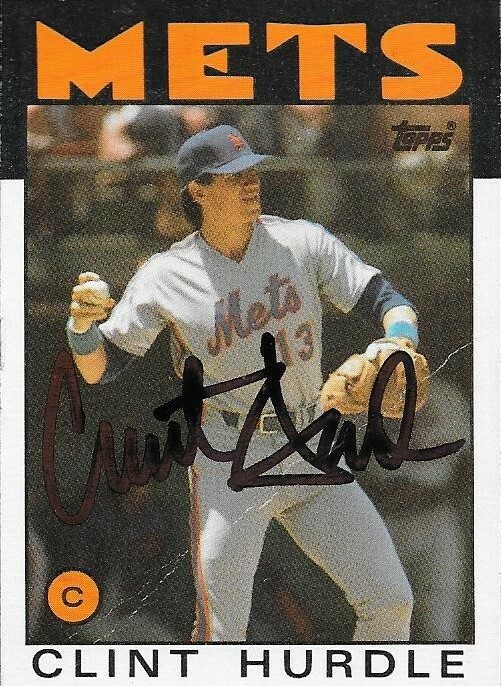 Cal is the son of former Major Leaguer, Paul Quantrill. I mailed to Quantrill on February 10 and got the card back on February 17, for a 7-day TAT. 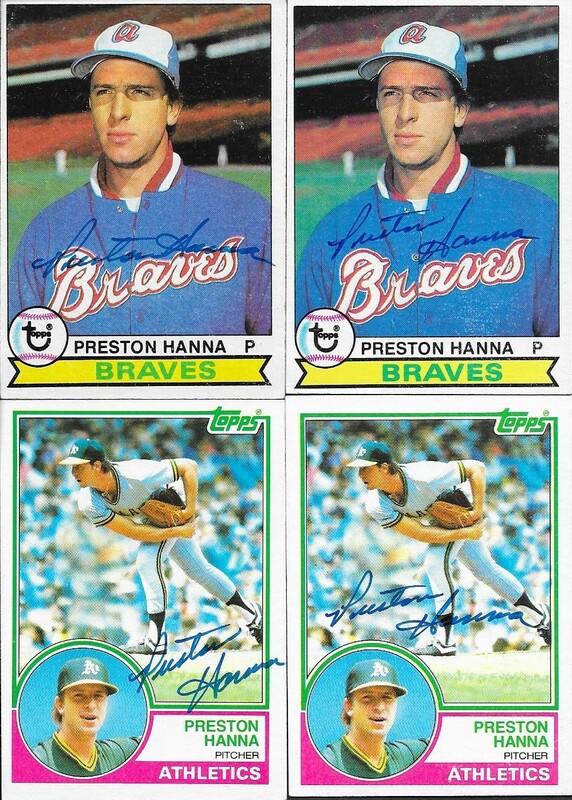 This TTM Success from former Brave, Preston Hanna, was one of the few that provided me with extra cards upon return. I sent off four cards and Hanna sent three of his own. I sent this 1980 Topps out of a partial set I had gotten from the Columbia antique shop, which turned out really nicely. 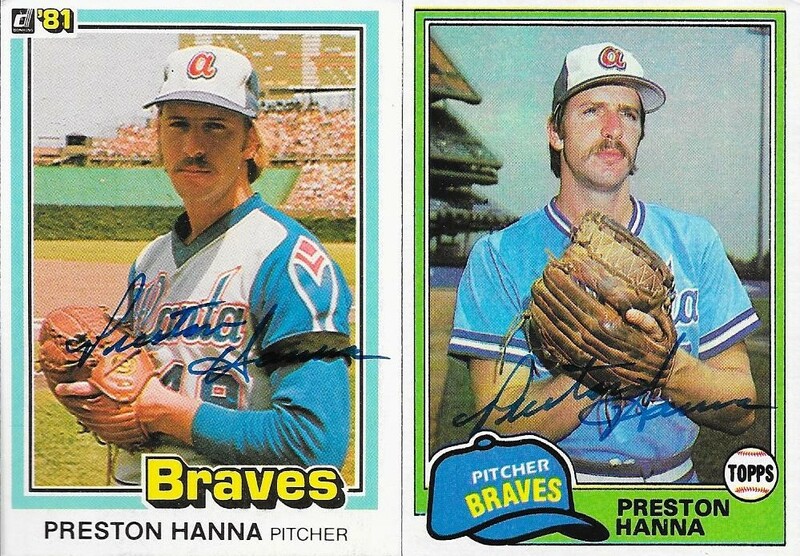 The 81 Donruss (left) was a gift from Hanna. I provided the 81 Topps (right). I got extras of the 79 and 83 that I sent along, so one of the 79s will go to my friend, Brandon, and the extra 83 will become trade bait. Hanna (b. 1954) played in the majors from 1975 to 1982 for the Braves and A's. He had a career record of 17-25 with 253 strike outs and a 4.61 ERA. I mailed to Hanna on January 25 and got the cards back on February 16, for a 22-day TAT. 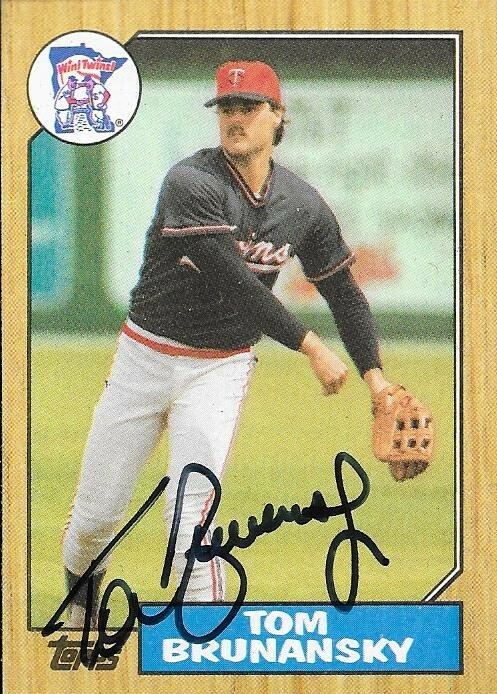 I completed a trade with fellow blogger, GCRL, that landed me this Tom Brunansky for my 1987 Topps set. I had Brunansky set aside to try TTM, but this card allows me to send something different, instead I traded my extra 1989 Topps Bill Bene for this card. Brunansky (b. 1960) played in the majors from 1981 to 1994 for the Angels, Twins, Cardinals, Red Sox and Brewers. He had 1,543 hits 271 home runs and a .245 batting average. He was an All Star in 1985 and won the World Series with the Twins in 1987. 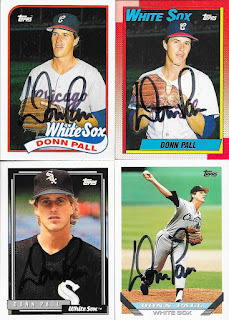 Donn Pall was a player who had been in my box probably since I first put it together and organized it for TTMs. For whatever reason, I kept bypassing him and kept sending to other players, when I finally decided to get his cards out in the mail. The above 1993 Topps Stadium Club White Sox was a unique card in the box that I really wanted to send. In the end, I have no idea what took me so long, but here we are with a success. The only drawback to the success was that this card, the one I really wanted to see come back, was damaged in transit. It is hard to see from the scan, but the bottom left corner took a major hit. It will be forever protected in my binder from here on out, but I hate that it got damaged in the first place. I have been lucky that my hundreds of cards come back safely, so I can't complain too much. I sent off four Topps cards, a 1989, 1990, 1992 and 1993. 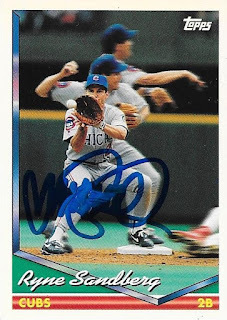 The 1992 is hard to see the signature in person, but the scan picked it up. Finally, here is a 1990 Fleer. I had a big box of these somewhere, but can't seem to find them. These are really clean cards and look great when signed. I think the box is shoved under a bed somewhere, so I hope to find them sometime. Pall (b. 1962) played in the majors from 1988 to 1994 and 1996 to 1998 for the White Sox, Phillies, Yankees, Cubs and Marlins. He had a career record of 24-23 with 278 strike outs and a 3.63 ERA. I mailed to Pall on January 8 and got the cards back on February 15, for a 38-day TAT. This TTM success came in recently, but because I have a couple guys in my boxes with similar names, I almost sent to him again. 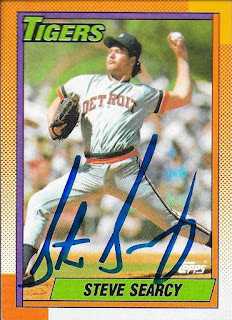 I think I counted four different Reeds in my TTM box, so I almost send an 87 Topps out to Jeff Reed, when I already had one to be blogged. Oh well, I doubt it would be the worst thing to happen. 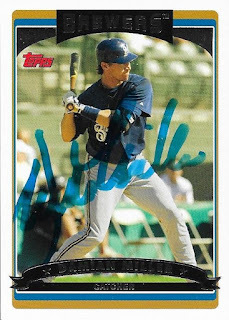 The above 1997 Fleer Ultra turned out really nicely, even though the Sharpie Reed used wasn't all that great. I like the shot on the card. 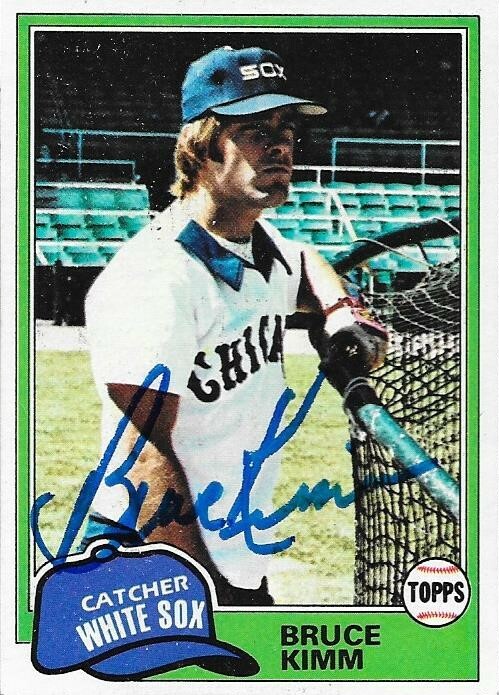 I do enjoy cards showing catcher's gear for some reason, and this one is pretty good. I don't know where the 1987 Topps Traded (middle) came from, but I had it in my box. I ended up getting it and his 1987 done, so that was good. Reed (b. 1962) played in the majors from 1984 to 2000 for the Twins, Expos, Reds, Giants, Rockies and Cubs. He had 774 hits, 61 home runs and a .250 batting average. I mailed to Reed on February 1 and got the cards back on February 15, for a 14-day TAT. 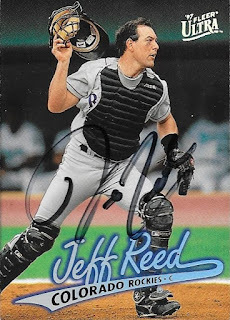 As I was about to post this entry, I realized that I HAD already gotten Reed TTM before. Back in September 2017. Oops. I didn't get him on an 87 then so I got it right this time. 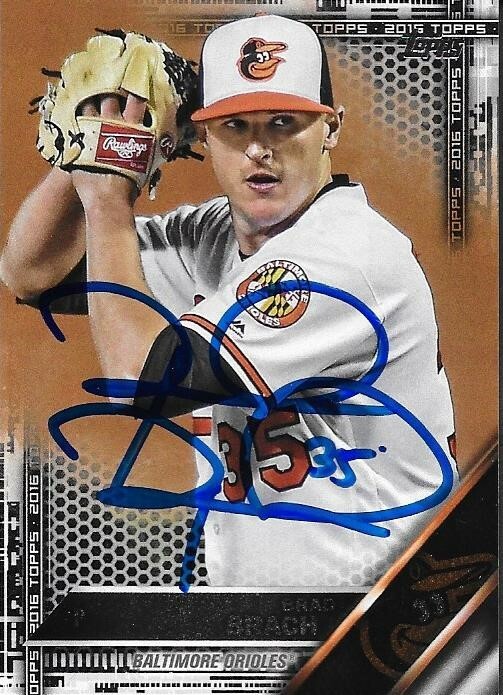 My buddy Michael sent me this Brad Brach that he got signed for me at Orioles Fan Fest this past January. Michael really liked the card, and was reluctant to give it up. I know he liked it, but I had bought it from my friend, Anthony, and really wanted to get it signed. I appreciated Michael sending it back to me, and he knows that I will make it up to him sometime soon. The card is a 2016 Topps black parallel, and turned out really nice with the signature in blue Sharpie. Thanks for sending the card back, Michael. You'll get something in return, I assure you! Here is another TTM success that landed me a 1987 for my set, this time from Lee Guetterman. I sent 4 cards and ended up with an extra with this success. He sent me his own religious tract card (top left) and I included a 1988 Topps, 1989 Topps Traded and a 1992 Topps. Guetterman (b. 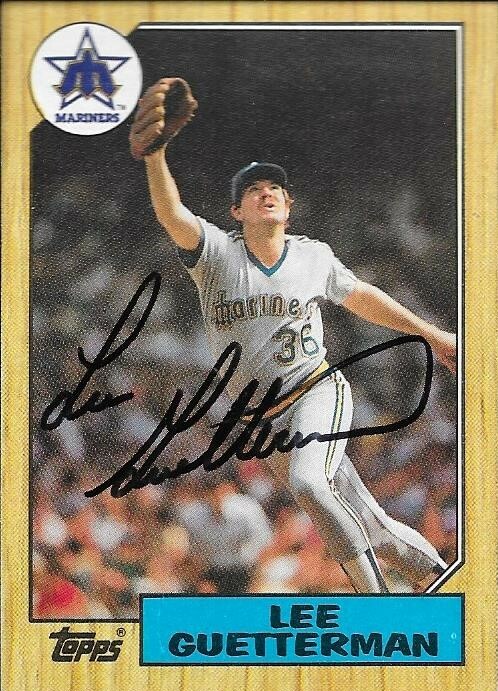 1958) played in the majors in 1984, from 1986 to 1993, 1995 and 1996 for the Mariners, Yankees, Mets and Cardinals. He had a career record of 38-36 with 287 strike outs and a 4.33 ERA. I mailed to Guetterman on February 5 and got the cards back on February 15, for a 10-day TAT. It took a while, but I got a TTM success from Twins reliever, Matt Belisle recently. I had sent to him during last season via the Twins, and the cards finally came in signed. The above 1999 Bowmans Best turned out really nice, but the scan doesn't really show how cool the card looks. This 1999 Just Minors looks really cool, as well. 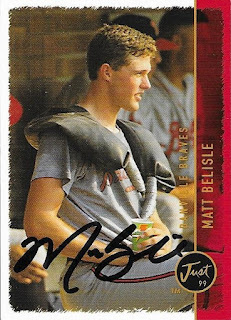 A 19-year old Belisle is shown on the card. I didn't realize he had been around as long as he has. 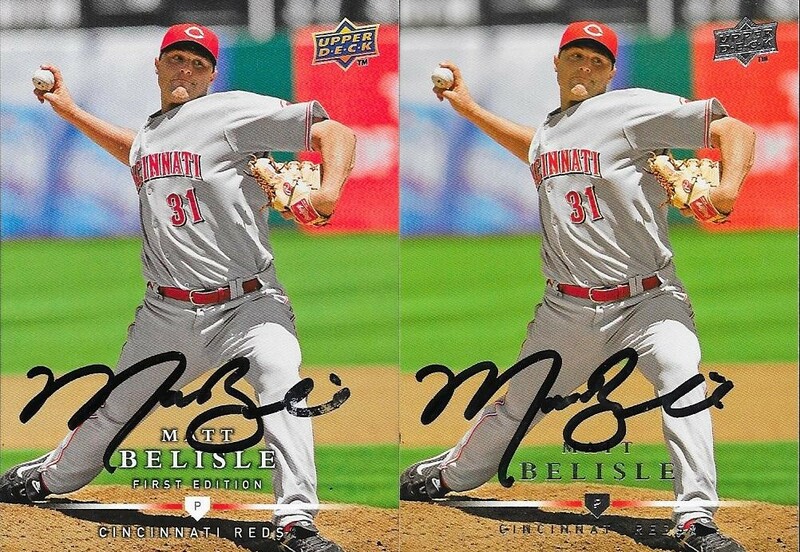 Finally, here are two similar, but different, 2008 Upper Deck. The one on the left is a 2008 Upper Deck First Pitch, and the one on the right is an 08 base. 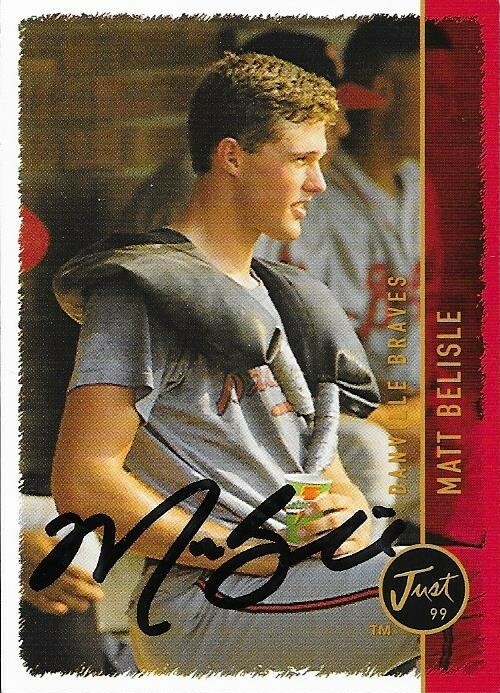 Belisle (b. 1980) has played in the majors since 2003 (he missed 2004) for the Reds, Rockies, Cardinals, Nationals and Twins. He has a career record of 51-57 with a 4.19 ERA and 686 strike outs. He signed as a free agent with the Indians on February 25, 2018. I mailed to Belisle on June 12, 2017, and got the cards back on February 15, for a 248-day TAT.